In my last blog I wrote about the difficulties in choosing a selection of bags for the upcoming nineteenth century costume exhibition at Kelvingrove Art Gallery and Museum in Glasgow. Bags seem to be one of the few accessories where function, design, materials, and techniques have remained fairly static since the nineteenth century. Not so the umbrella. I have three of my own at home, each one more boring and disposable than the next. One compact Totes that fits in my handbag, one novelty clear plastic one that is always inconvenient, and one giant golf umbrella printed with the logo for a building company (I pinched it from my dad) which lives in the car and only sees the light of day when I remember it’s there. 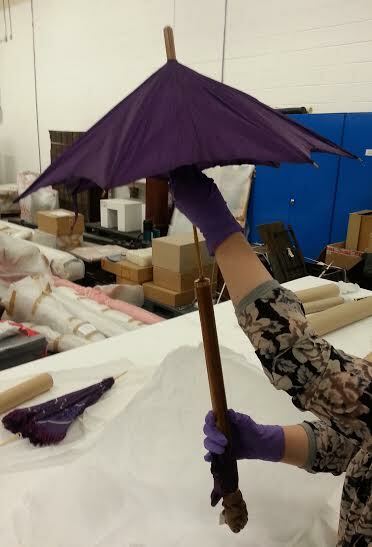 Glaswegians of the nineteenth century, however, took rather more pride in their umbrellas. Among the collection are examples with gold or mother of pearl handles, engraved with their owners names, spectacular canopies painted with gold swans, and exquisite silk tassels as standard. There are two particularly outstanding examples we have chosen for the exhibition that I want to share with the readers of this blog; partly because it would be wonderful to hear from anyone who has come across similar in their own collections, and partly because such gorgeous objects deserve to be seen! The Drooko Royal Umbrella (fig.1) was made by Joseph Wright of Glasgow, and the slogan used to promote the brand was ‘I walk the world a raintight fellow, beneath the Joseph Wright Umbrella’. 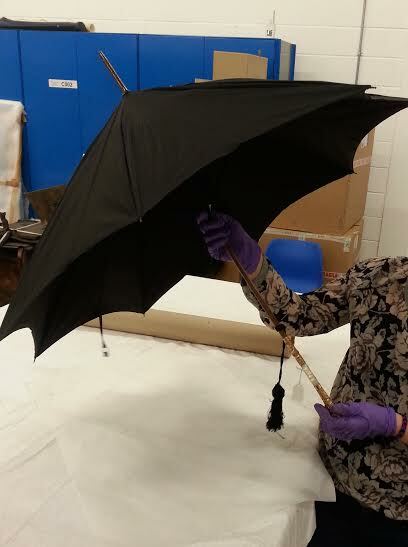 The word ‘Drooko’ likely comes from the Glasgow word ‘drookit’ which means to be soaked to the skin by rain (funnily, as the only Glaswegian in the room when we examined this umbrella, I understood ‘Drooko’ right away and thought it was a great joke). 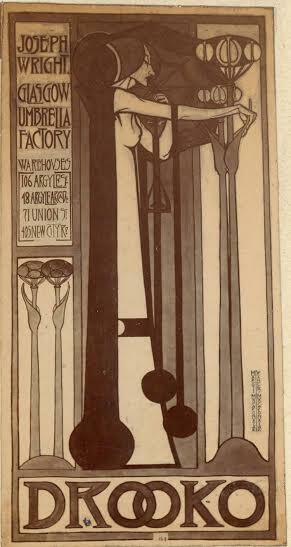 Apart from it’s gold and mother of pearl handle, the umbrella itself is a study in elegance, and while it would have been an expensive object, the Drooko brand was very successful - Wright had four shops in Glasgow alone, and commissioned the Macdonald sisters to design his advertising (fig.2) - suggesting that it was a popular choice for Victorian Glaswegians. The Vickery umbrella (fig.3) is another curiosity. 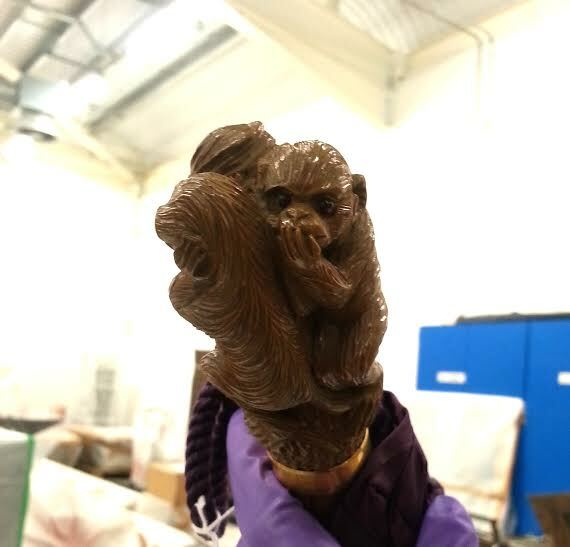 In perfect condition, the handle is beautifully carved with the three wise monkeys (fig.4), and the canopy is in a deep, rich purple. The interesting thing is that it morphs from a chic umbrella into what appears to be a truncheon by unscrewing the canopy section. I’ve been searching for similar Vickery examples, and there are a few to be found in British collections and in records of past auctions; my theory that the umbrella morphs into a truncheon is supported by few but not all records, so I remain open to suggestions! Having examined such fabulous specimens I’ve made it my mission to dispose of the disposable and seek out my very own Drooko or Vickery, an umbrella to last a lifetime, hopefully before it starts raining.